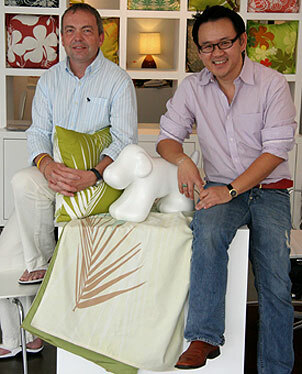 Edward Macey, left, and Kaypee Soh, co-owners of so'mace, creative lifestyle gallery. Though so'mace, creative lifestyle gallery, won't officially open until tomorrow, the artwork-and-home-accessories boutique began seeing a trickle of shoppers in the two months leading up to the event. Shoppers can be divided into two groups: Some early birds search out the retail gallery space, lured in after completing errands in the neighborhood or hearing positive comments spread by word of mouth. Others make their presence known by pressing their faces against the glass window and peering in. Soon, shoppers won't have to wonder about the space anymore: The gallery's signage will be hoisted onto the roof in time for a private party tonight. Friends and colleagues will celebrate "our first attempt at a retail gallery," said Edward Macey, who began so'mace in 2004 with Kaypee Soh; the store name is a blend of their last names. Previously, so'mace was a branding and Web design service, but Soh and Macey have branched out to include the retail gallery at the front of their new 1,400-square-foot loft. The gallery primarily features Soh's artwork and his prints on soft surfaces such as pillows, wallpaper and rugs. Prototypes of Soh's newest creations, tote bags made from recycled material and sample wallpaper in so'mace's signature red, will be available this weekend, with the final versions expected in store in four to eight weeks. Soh has also picked up artwork - mainly accessories - by artists such as Domingos Totora, who incorporate themes of sustainability and limited production into their work. Totora is a designer who creates vases and other containers from recycled cardboard. Furniture from Pacific Home also is featured. Plans include creating dinnerware and refurbishing old furniture - likely to be adorned with Soh's artwork. "The challenge is to find nice furniture," said Macey. "It's on our things-to-do list." "I'm excited and a little bit nervous," said Soh as opening day drew near. "I have so many ideas and a need to produce them all." so'mace, 1115 Young St., is open 10 To 6 P.M. Tuesdays through Saturdays and Mondays by appointment. Call 593-8780.